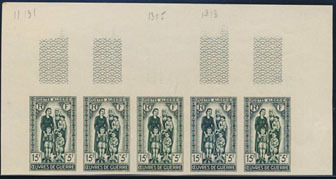 16068 ESS ALGERIA (1939) Caillié*. Lavigerie*. Duveyrier*. Trial color die proof in green. Pioneers of the Sahara. Scott No B29, Yvert No 150. Scarce! 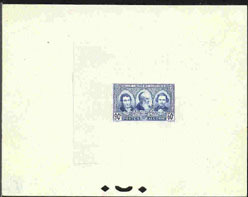 17914 ESS ALGERIA (1951) Col. Colonna d'Ornano*. Fine Arts Museum*. Trial color proofs in margin strip of 5. Scott No B62, Yvert No 286. 17916 ESS ALGERIA (1955) Women*. Children*. Trial color proofs in margin strip of 5. Surtax for war victims. Scott No B83, Yvert No 330. 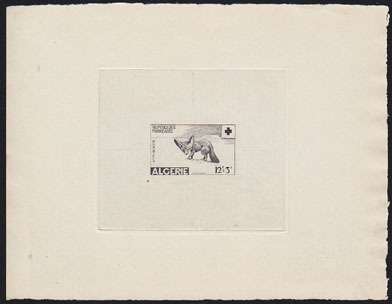 3154 ESS ALGERIA (1957) Fennecs*. Red Cross*. Trial color proof strip of 5 with multicolor. Scott No B88, Yvert No 343. 18073 ESS ALGERIA (1957) Fennecs*. Red Cross*. Die proof in black. Scott No B88, Yvert No 343. 18197 ESS ALGERIA (1957) "On the Banks of the Oued" by Fromentin*. Trial color proofs in strip of 5 with multicolor. Scott No B92, Yvert No 347.